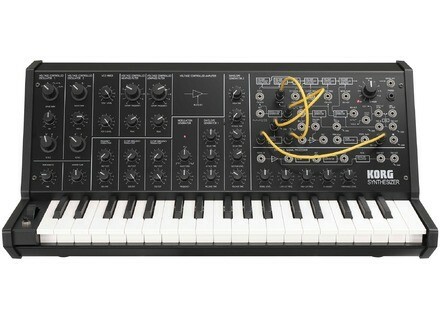 MS-20 Mini, Analog Synth from Korg in the MS series. The Mini (MS-20) has 37 keys and is an analog synth that comes with a smaller patch bay system on it. IT does support MIDI and USB connections. If you have ever used an original synth or the original ms 20 you will know how much fun they are to work with and they actually have helped me understand sound creation better than what working with a VST did. Working with the MS-20 is not easy by any means and it will take some general knowledge of working with analog synths and patching sounds but it is much rewarding once you figure it out. The Mini is very small and portable as well. It does not take up much room on my desk and it is built very well. I have just received my MS-20 Mini and I love everything about it. There is also an external signal processor that can work with my other instrumentals that I want to use it with. 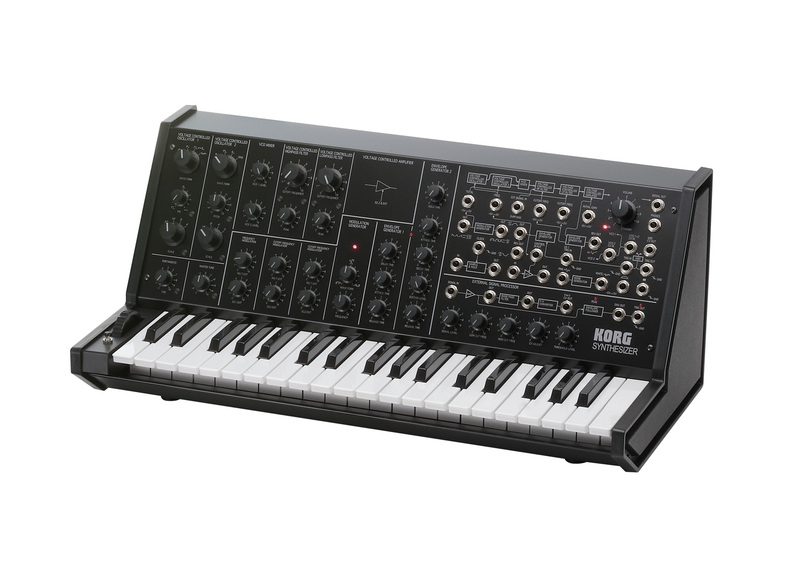 The ms-20 Mini is very similar to the original MS-20, I think it is exactly the same from what I remember of the original this one this just a lot smaller. I am able to plug my other gear directly into this ms-20 Midi and start tweaking the sound. That is one feature that really made me want to purchase this synth from the start. You can even add a full sized keyboard 88 keys, if you need them or want to perform with it and have the full range of sound. The MS-20 Mini fits perfectly into my home studio and I am very happy I purchased it. The price was not that bad at all either considering what it cost to purchase some analog synths these days. With no presets, no memory and no sequencing I can see why some would not want to bother with a synth like this. But it is well worth it, and it is very rewarding building your own sounds! petitsynthe's review (This content has been automatically translated from French)" The first retro-synth!" As the mini MS-20 mini-keys, if you want to play furious solos, it will be difficult ... if not, connect an external MIDI keyboard or buy the kit version (twice as expensive when same)! As for manufacturing, it seems very correct for the price. I do not advise as first or only synth due to both the lack of memory, limited MIDI (but compared to the original, that's a lot!) And semi-modular side not so obvious at first ! All this explains why in my opinion the most resales synth secondhand because it had a "buzz" his enormous output and some are surely precipitated without thinking! (for use without the module part). on the other hand, it is a perfect synth for those who like to experiment ... I must say that with such a look, it will be douterai! I said that I had the original there almost 20 years (it was already hyper vintage at the time!). In any case, when I refer to my recollection, it sounds like the original ms-20, the difference may be the stability of oscilloscope that here "driftent" not (but that is surely due to the age of the machine). About the famous controversy on the breath, all I can say is that mine virtually no breath (or maybe I got lucky ... or I become deaf with the age!). for example the recent Moog have a much bigger sound with thicker oscilloscope but ultimately sound less "live" too straight. Note that I am not saying that these Moog does not sound good - indeed they are perfect to complete - I'm just saying they lack that little something mind of the mini-MS20 and most vintage synths! the HP filter around 9am and resonance to 15h, it is as if a sub is rajoutai). 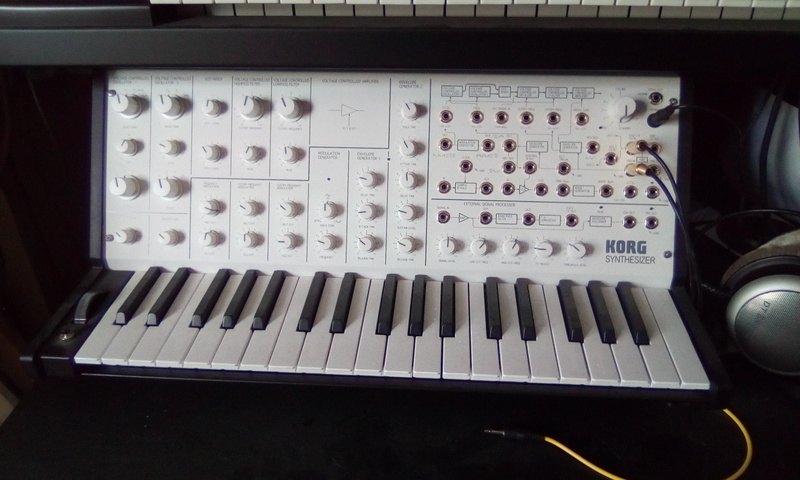 This synth excels in special effects and sounds a bit "dirty" we must say that the original has been widely used in the beginning of the new-wave (experimental / cold wave trend) but more recently, in the late 90 by electro artists (the best known are Air, Mr oiso or Portishead). 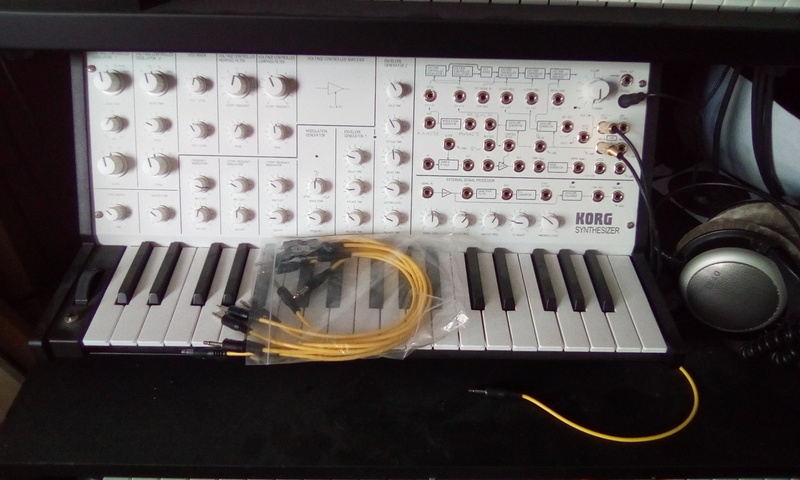 It seems to me that this is the first reissue of a vintage analog synth (at least on a large scale), it is either a particular stage in the history of synths! Given its success, Korg expected to repeat another classic: Arp Odyssey ... when will reissue polyphonic such as the Prophet 5 or Jupiter 8? The mini-MS20 is perfectly complementary to other synth alone because it is a little too distinctive, but it sounds so much more "vintage" (or some idea that one has the vintage sound) than the other competitors out in recent years! It is certainly not very practical in the context of creating a song (no memory, limited to MIDI notes, time to patch) but this sound so delicious grain, it is just an excuse! Eddyemma's review (This content has been automatically translated from French)" Breath? Not so sure ..."
The manual is a reprint of the 1978, nice to set the mood. Very simple edition, which complicates a bit if "semi modular" dimension of beast is approached. The sound is very close to the original MS20, I have too. That's right, it Drifte less, but it is a real success! HOWEVER: some models are affected by the interest generated by the blast stage VAC / VCA envelope. So 10/10 if you come across a model that is not affected, if ... Thumbs down! Two failures, and I did not get to exchange, so I've returned to regret the Afien who had sold me ... A guy's cool that I welcome the passage Hello Willy ! What a pity! One could hope for a third of the price of vintage MS20, have almost the same sound with an easy to carry and reliable for many years machine is missed! Korg hope that we would not try it out with their revival of the ODYSSEY! Unsuspecting friends! Kaiser-Sose's review (This content has been automatically translated from French)" Delirious!" This is a small 3 octave keyboard with mini keys. Other reviews describe the possibilities and are more comprehensive than me. I emphasize that this is a MONO synth! This is could not be more straightforward on the side knobs, but once you pass the patches, it takes a little more experience. I recommend the use of colored cables to better see the routing of sound. The manual is ample and patch are examples of practices early. I play earlier planing and quiet music, and the addition of its sounds really helps. Bass response, nice and slamming compared to a moog. Leads are clean. There are currently no aftertouch or velocity. The value for money is pretty good. With no doubt, for the same price I would resume the MS20. The charm of analog and low price make it the perfect synth for my style. Our team went to the Korg booth at NAMM to discover one of the stars of the show, the MS20 Mini synth.